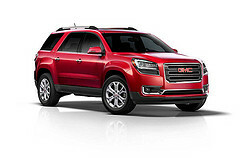 One of GMC’s most popular SUVs is the Acadia. 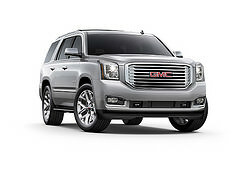 The mid-size SUV is great for families with the versatility of an available third row and modern technology. For the upcoming 2019 model year, GMC has announced a series of Acadia updates that will make it even more appealing. For starters, the exterior color options are getting adjusted. While GMC is taking away three choices (Mineral Metallic, Black Cherry Metallic, and Crimson Red Tintcoat), it is adding four new options: Red Quartz Metallic, Pepperdust Metallic, Dark Sky Metallic, and Smokey Quartz Metallic. For those looking for a darker overall appearance, the Acadia Black Edition package will be available on the SLT trim. This special edition model comes with a black grille insert and surround, 20-inch machined aluminum wheels with black accents, black roof rails, black headlamp and taillamp accents, black mirror caps, and other accents. Standard features on all models will include Bluetooth® connectivity, a 7-inch touch screen, OnStar® with 4G LTE Wi-Fi capabilities, Android Auto™, and Apple CarPlay™. We can also look forward to even more changes for the 2020 model year, when the Acadia is due for a mid-cycle refresh. With that update, we can expect to see powertrain and styling changes. Visit us at Bradshaw Automotive to test-drive this well-rounded SUV for yourself. By now, the school year is in full swing. For many parents this also means their lives are in constant go mode with soccer practice, dance classes, football games, after school band marching band rehearsals, and more. It can be hard to manage your chaos, but GMC wants to help. GMC’s lineup of modern, capable, and spacious crossovers and SUVs may just be the perfect solution for controlling all the after school madness. On the small end of the spectrum, there is the GMC Terrain. It offers seating for up to five passengers and has exclusive MultiFlex sliding seating that allows you to expand the cargo space when you need it and give passengers extra leg room when you don’t. Behind the rear seat, you can have as much as 31.6 cubic feet of space, more than enough for a saxophone case, a pair of dance shoes, and a bag with all your soccer equipment. Step up a notch to the GMC Acadia, and you’ll get seating for seven or eight passengers. With the SmartSlide seating in the second row, passengers can easily access the third row of seats. And, with the third row folded, you gain 70.1 cubic feet of cargo space. At the top of the scale is the Yukon. You’ll be able to squeeze up to eight passengers inside—enough for a basketball team, a coach, and two reserve players. And, with the spacious interior, nobody will feel cramped and you’ll still have lots of cargo space behind the third row. Stop by Bradshaw Automotive to see which GMC crossover or SUV will be the perfect fit for your family’s busy lifestyle and all the gear that goes along with it.